Fishing can be a lonely activity if it’s not a two-person fishing kayak. You may want to go on a fishing trip with a friend and learn how to fish. However, you’ll only enjoy the trip if you’ve the right kayak for it. If you’re looking for best tandem fishing kayak, our comprehensive list will help you make the best choice. Here’s our list of the best tandem fishing kayaks. We’ve reviewed many fishing kayaks while compiling this list and only picked the ones that suit your needs and budget. 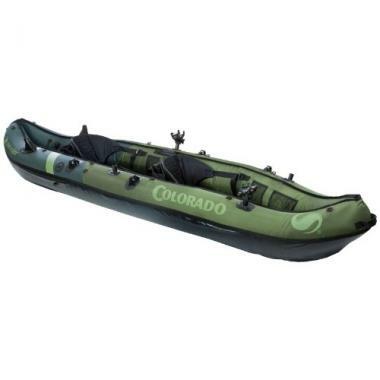 Coastal Cruiser kayak has a wide flat bottom for stability and supports up to 770 lbs. Bow has built-in rotomolded handle while the rear has attached flexible grip. The kayak can be transported with a cart or carried easily by two paddlers. It comes with supportive seats with aluminium frames, dual adjustable and multiple positioning options. It also has a forward recessed area and rear cargo area with bungee cords that can be fitted easily with mesh cover. Each seat has a watertight storage hatch that’s secure. Multiple built-in fishing pole holders help keep baited lines in water hands-free during still or trolling fishing to keep rods out of your way while paddling. 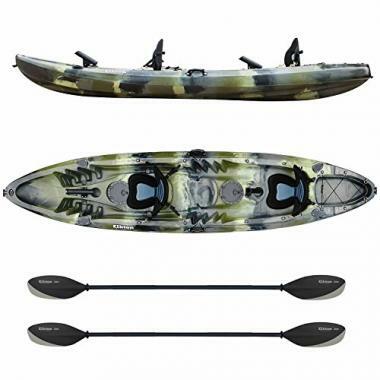 BKC UH-TK181 is the top rated 2 person fishing kayak. It weighs 68 pounds and has four carrying handles that make it easily transportable by a few people. It’s also the best 2 person fishing kayak because it can hold two people comfortably. Its maximum capacity is 450 pounds. It has additional storage at the back seat and a large rear compartment with a bungee tie-down system. The kayak can be manoeuvred easily, has good tracking and has a well-balanced hull that keeps it stable in rough waters. The kayak has two deluxe seats, multiple foot rests, two bungee paddle rests and two lightweight aluminium paddles. Coleman Colorado is comfortable to ride and stable on water. It will enable you to get out on the water even when you don’t have hardshell tandem fishing kayak space. The Sevylor Coleman Colorado 2-Person fishing kayak can hold 470 pounds when inflated. It can also be compacted to fit into a handled storage bag. Coleman’s Airtight System is leak proof and you won’t have to worry about sinking or leaks while in the middle of the sea. The 840D nylon cover and tarpaulin base are extremely durable. In case your kayak gets a puncture, you’ll stay afloat and get back to the shore safely due to multiple air compartments. 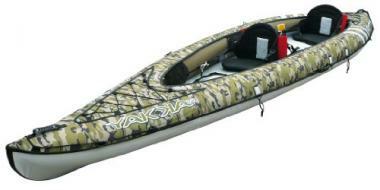 It’s ideal for kayak fishing for 2 person since it fits two adults. You won’t be able to put in anything else because of a cooler box in the rear and some tackle in the side mesh compartments. The Berkley adjustable rod holders will help you keep your rod at the angle you set to allow easy hands-free fishing. You’ll however have to buy an electric or foot pump and a set of paddles for this two person fishing kayak. 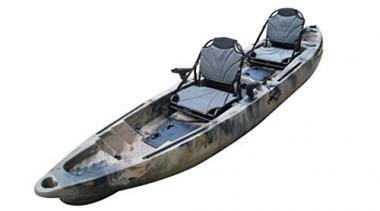 Tandem angler kayak has two adjustable comfort flex seats to enable you sit for longer periods comfortably. The auto trim hull is useful if you choose to paddle solo from the stern seat. This kayak weighs 62 pounds and the hull keeps the bow in water to enable you glide through the water and maintain control. It’s also a double fishing kayak since it is in between a sit-on and a sit-in. This kayak has a glide track foot brace system to help you manoeuvre through rough waters and can carry up to 500 pounds. You can have multiple fishing rods positioned for your catch with the two Canon rod holders and six rod-mount receivers. You can also remove the front seat and store extra fishing or hunting gear. The lifetime 10 foot kayak is designed to accommodate up to three people. It has a wider hull that offers great stability that makes it to manoeuvre easily while enabling you to reach those deep sea fishing spots that are hard to get to. This kayak can hold up to 500 lbs and is made from high-density polyethylene that’s durable. It’s equipped with multiple foot rests, two lightweight paddles, one moulded seat, two padded seats and cup holders. The scupper plugs drain quickly any water in the cockpit. If you decide to use a fish finder, the scupper holes will allow a transducer to pass through. It also has a large front compartment with elasticated cords and adequate storage. 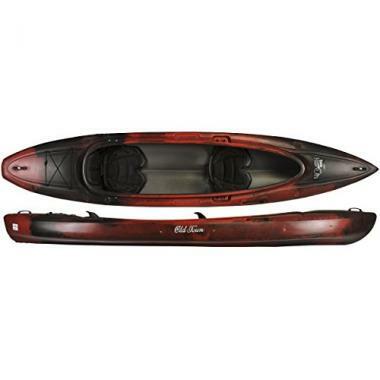 Elkton outdoors kayak is large enough for two people and the gear you need. It’s easy to transport since two carry handles allow for convenient transportation. This 2 seat fishing kayak is durable because it’s constructed with a rotomold injected body to protect your kayak from getting a puncture or cracking. It has two storage areas located on each end, two seats, bungee cords, two paddles, rod holders and a designated platform for ice chests to ensure you never leave anything at the shore while using your fishing kayak. 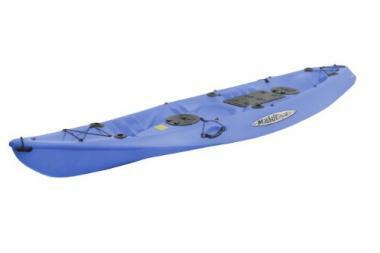 The Malibu Pro 2 kayak is a recreational kayak designed for flat water, lake and ocean paddling. It’s multi-functional and ideal for diving, fishing and paddling. This two seater fishing kayak can be paddled with one person or sit two people comfortably. The kayak can be carried easily by a few people and weighs 62 pounds. With a maximum capacity of 550 pounds, it can store dive tanks because it has enough buoyancy and is also stable. 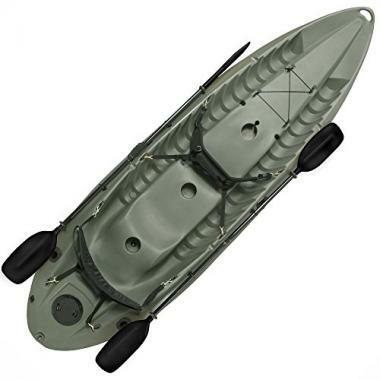 This kayak has multiple foot rests, 8 inch front and rear bucket hatches and a large central storage hatch. You can also install a motor unit. The BIC Yakkair kayak comes with 2 fishing backrests and rod holders. Integrated keel system and high pressure offer the tracking and performance a convenient inflatable kayak. It has a pump, footrests, hull, transport bag and backrest. This two man fishing kayak weighs 42 pounds and can be used solo by mounting one of the seats in the centre of the kayak. However, this can only be possible if the correct fittings have been included in the design. 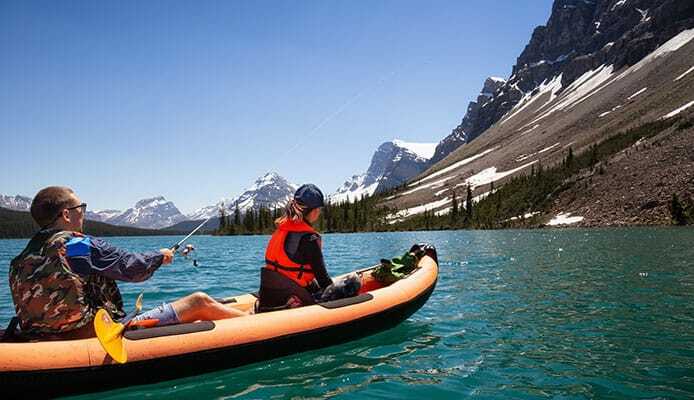 Sit-on-top kayaks will enable you to wade while you fish because they offer increased mobility. On the other, sit inside kayaks have adequate room for storage and handy storage compartment but will limit your mobility. Most anglers prefer the sit-on-top kayaks but if you want to brave inclement weather, go for sit inside kayaks. This will depend on whether you prefer a built-in holder (rigged) for your fishing rods or putting one in yourself. This is what differentiates a fishing kayak from the normal one. Also, some kayaks come with the option of an inexpensive unrigged variety. Dimensions play an important role in your vessel’s stability, pace, manoeuvrability and handling. For instance, if the kayak is long, it will go faster and provide more stability. Fishing kayaks are usually wider for stability which is the main factor especially if standing up while you cast is the option you want. Ensure your back and hips are well supported since you’ll be spending long hours parked on your backside. Ensure you’ve enough storage space for storing your packed lunch, catch and tackle boxes because fishing trips require you pack more gear than usual. This will enable you to set up many rods at the same time because of having more fishing lines in water. Look for a mixture of adjustable mounts and flush mounted to get your angle right. You’ll be able to dig in and get the leverage needed for the big catches when you’ve a few different foot rests. Use fish finders to look for a built-in scupper holes in order to enable transducers to pass easily. If you want added stability, go for rectangular rear ends to enable mounting of an electric motor. Q: Who Can Benefit From A Tandem Fishing Kayak? A: Tandem kayaks are ideal for anyone planning to go fishing with family/friends and will enable you to take turns while rowing and fishing. You can also store items in tandems because they’re large or use the extra seat for more storage if you go on a trip alone. You also don’t need kayaking experience to paddle one. You can hop in with no experience and have fun since they’re easy to manoeuvre. Q: Are Tandem Kayaks Safe? A: Yes. Their stability is much greater due to their broad base. Even less experienced paddlers can manage the stability of the boat in rough waters. Q: What Are The Pros And Cons Of A Tandem Fishing Kayak? Fishing from a tandem kayak can be a wonderful shared experience. You’ll be able to bring a friend or kayak with your dog. If one of you isn’t into the fishing aspect, he/she can still enjoy the paddling or just lie back and chill. Having on board an extra person will help you do more. You can position the kayak in a prime position while you hold the cast net and hopefully catch more fish. It’s difficult to get around depending on how well you’ll collaborate or how experienced your friend is. 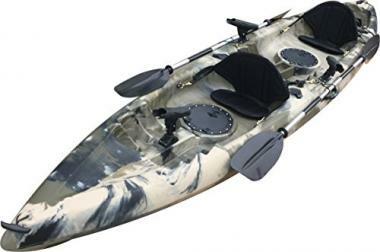 Tandem fishing kayaks have features that are meant to enhance your fishing experience. 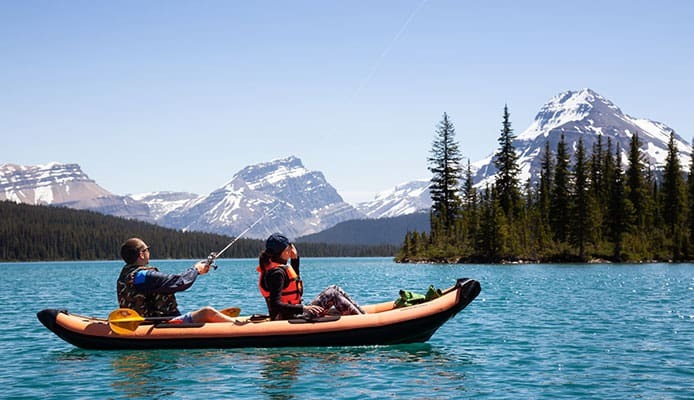 If you’re purchasing a tandem kayak that will enable you reach the best fishing holes, then go for a tandem kayak for fishing since it’s designed for fishing.